The evening’s proceeds go to the CT Hort Scholarship Fund which provides scholarships to deserving horticulture and plant science students at the University of Connecticut and the Naugatuck Valley Community College. 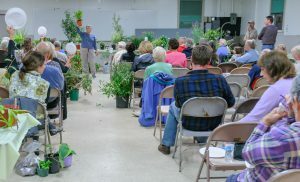 To donate plants or for more information, contact the Plant Sale & Auction Committee at auction@cthort.org or call the CT Hort office at (860) 529-8713. Pot: When donating from your garden, resist the urge to make small divisions, larger specimens sell better. Include a label with the plant’s common and botanical names (if possible) and its cultural preferences. Deliver with a list of plants donated including your name and address so we can provide a receipt for tax purposes. Ask: Call on local nurseries, fellow gardeners and garden centers for their tax-deductible plant donations. Bring along the donation letter and auction flyer located on our website – cthort.org. Please provide us with a list of the donated plants and the nursery’s name and address so we can thank them for their generosity. Help: As always, we need volunteers for all sorts of things. Please help to get the word out by printing and posting our auction flyer at nurseries, grocery stores, libraries, etc. Printed flyers are available at the CT Hort office in Rocky Hill. Enjoy: Come have fun and support a great cause!